One of the most difficult aspects of any divorce can be reaching a fair, healthy conclusion as to who will primarily care for your children. In some circumstances, this decision can be simple if one parent cannot care for the kids for any number of reasons. Illness, job requirements, financial woes or legal problems are just a few reasons why one parent may not be able to properly care for their children. But, for so many others, the battle to fight for their rights as a parent can seem like an uphill battle. This can be especially true for fathers hoping to gain primary or shared custody rights. In the heat of a child custody battle, disagreements can become messy and tensions run deep. As a dad fighting for your legal rights to your kids, you wan to do everything you can to help your case by avoiding unnecessary drama, frustration, and fighting. You deserve to have fair, equal treatment from the courts throughout your divorce. If you’re capable of providing your kids with the love and care that they need, then you shouldn’t have that responsibility denied to you. Your marriage bay be ending, but here are a few common mistakes to avoid as a dad that can help strengthen your case during a child custody battle. Telling Your Kids Every Problem Between You and Their Mom. It isn’t there responsibility to be the judge and jury of your broken marriage. Do your best not to get them involved in the gory details of your divorce. Remember that nobody really “wins” during a divorce. It’s your job to conduct yourself in such a way that your kids’ wellbeing stays the focus throughout your divorce. Leave the dirty details between you, the attorneys, and the courts. Not Spending Enough Time With Your Kids. If you want to prove that your kids are a priority to you, and that you have the time available to be an engaged parent, make sure that you don’t skip out on any visitation days, scheduled meetings, or other events involving your children. Spending time with your kids can only be a beneficial thing for them. You need to show the courts that you have the desire and time available to invest into your kids’ lives. You may not have always been available to them during your marriage, but during your separation and divorce, make every effort to rearrange your life around your children’s needs. Becoming Emotionally Irrational. Do everything within your power to refrain from going on a public character-bashing spree of your ex-wife. Keep your anger between you and your divorce attorney. He or she will have the skills needed to adequately communicate your frustrations and problems to the judge without letting emotion cloud reason. Don’t spend time arguing over and over about “fathers’ rights” with the judge. The judge already knows the laws and your rights. Instead, remain calm and provide the courts with the concrete evidence needed to make a wise decision on behalf of your children. Moving in With a Significant Other. Your marriage has ended. A divorce can be a long, drawn out process. That’s a reality. And it’s natural to move on and find a new relationship to dive into. But, if you still have kids that need cared for, jumping into another serious, live-in relationship while child custody arrangements are still being decided could be extra difficult for them. In some cases, the courts may even be disapproving of the quick transition. It’s usually best to keep any newly developing relationships on the down low until your divorced in finalized and the details of your child custody arrangements are settled. Nobody is stopping you from moving on with your life; you’re just being encouraged to place your children’s emotional needs as a priority throughout the divorce process. Taking Your Kids Out of the Region Without Notification. 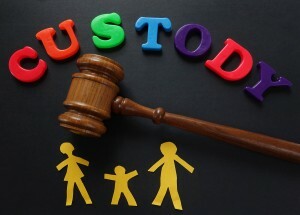 There are often rules and regulations set in place for both sets of parents during a custody battle and thereafter. This means that you typically cannot decide to move out of state with your child suddenly without court approval. Do not pick your children up from school or daycare without prior approval. Do not try to take your kids on an out-of-town vacation without discussing your plans with their mother, any caseworkers, and/or your attorney. Any unplanned trips with your kids can raise suspicions against you and your motives as a parent. Your primary goal as a dad is to show your kids, ex-wife, and the courts that you can, and will be, the loving father that can provide his children with the support, care, and time they need. This can only happen if you commit yourself to acting responsibly and with maturity throughout the divorce process. To learn more about how to protect your parental rights as a father and ensure the best possible outcome for your kids during a child custody battle, contact the law office of Michael E. Bryant today. He has the experience and compassion needed to protect your rights and keep your children’s best interest at heart during your divorce. Call 419-243-3922 today.